Former Celtic and current Cavalier says he had fallen in love with Boston. 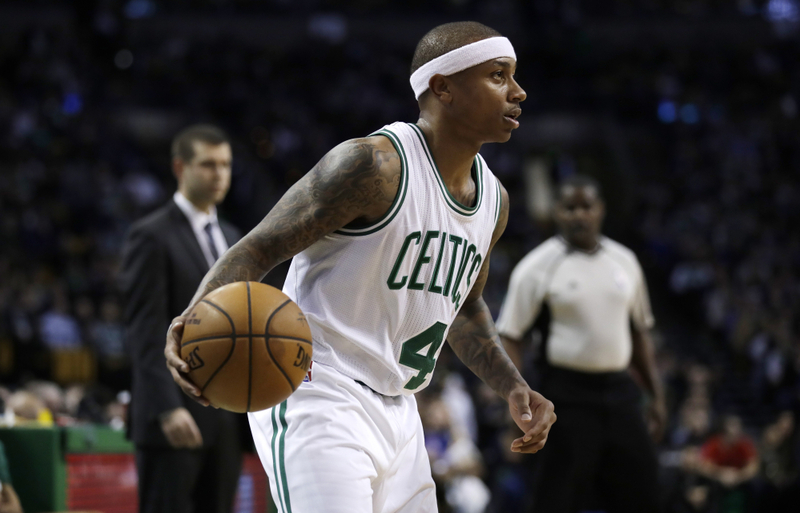 BOSTON — Isaiah Thomas’ two sons had different reactions to his trade from the Celtics to the Cavaliers. His older son, James, is excited that his dad will get to play alongside LeBron James. Thomas’ younger son, Jaiden, had fallen in love with Boston and was afraid that Cleveland won’t have any skate parks. “Everything about that trade, everything that I was feeling in my heart in those moments – they got it down to the only two things that mattered,” Thomas said in a 3,500-word post on The Players Tribune about the deal that sent him to the Cavaliers for fellow All-Star Kyrie Irving. A 5-foot-8 point guard who was the final pick in the 2011 draft, Thomas was a role player for three teams before he came to Boston at the 2015 trade deadline. He developed into a two-time All-Star and a fan favorite with the Celtics, leading them to the No. 1 seed in the East and an Eastern Conference finals matchup with Cleveland in last season’s playoffs. But an expiring contract – coupled with a desire for a new, maximum deal – and a hip injury that itself almost derailed the trade led Celtics boss Danny Ainge to trade Thomas to Cleveland along with Jae Crowder, Ante Zizic and a first-round draft pick. Irving had asked for a trade to a team where he wouldn’t have second-billing. Thomas said he is excited about playing with James, a four-time MVP, and Kevin Love, a former AAU teammate . “I’mma just say this here, point-blank, to get it over with – and then you can go ahead and post it on whatever bulletin boards you want to: You are not going to want to mess with the Cavs this year,” he said. After moving from the Celtics to their top rival in the East, Thomas said his job is now to destroy the team he helped build. Among the messages Thomas received after the trade was one from Patriots quarterback Tom Brady wishing him luck and telling him “You’re gonna do great.” That was bittersweet, Thomas said: He had hoped to build a Brady-like career as an unheralded draft pick who went on to become an all-time Boston great. “In my mind, I wanted to be the Celtics version of Brady and (Red Sox slugger David) Ortiz,” he wrote. “So when I got that text from Tom, you know, there was part of me that felt a little down.